We shouldn't be growing this. We shouldn't even try. Andy Phillips should be growing this in Encinitas, California. Acianthera prolifera is one of those orchids. The ones that want hot dry days and cool nights. The ones that go belly up here in summer. We excel at hot humid days and hot humid nights. April and October are the only months when an Atlanta greenhouse achieves the California greenhouse grail. And yet, this plant thrives in our back up greenhouse. There must be enough variability in the environmental parameters of its natural range -the area around Bahia, Brazil, Venezuela and Guyana at 1300 to 1600 meters- that allow it to thrive as a slightly dry epiphyte in an intermediate to warm greenhouse in bright light. And that's terrific, because I'm completely smitten with those thick, rough textured leaves that are bright green and shaped like shallow bowls. And the chain of aubergine flowers that open just wide enough for a tiny fly pollinator. 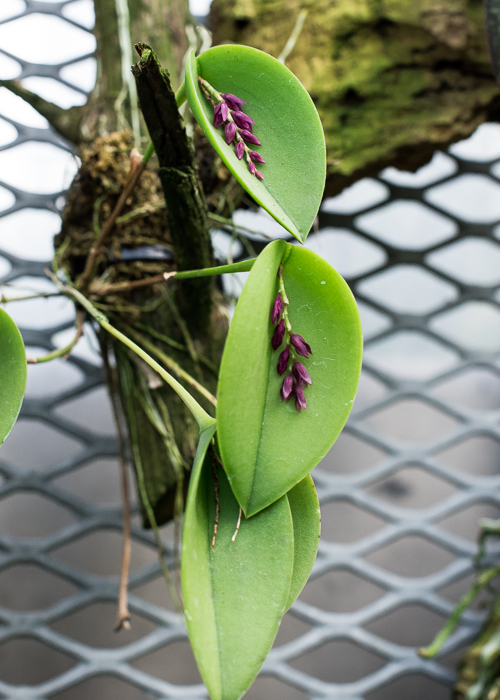 I think this plant will do reasonably well as an epiphyte in a bright location about six feet from the ground in our Orchid Display House, so be sure to look for it this spring.